You should have a say in the type of coverings that are over the seats of your new minivan. 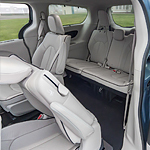 When you purchase the Chrysler Pacifica Hybrid, you will find that there are many different fabrics available for you to choose from. You can change up the look and feel of your seats when you drive this vehicle.